Here we have the incredibly talented Barrie Cadogan demonstrating the JPF Regent Combo amp with a selection of great guitars (and a not-so-great one for good measure). Introduced by Dr Frank Cooke. We are very fortunate to have roped the talented guitarist, Barrie Cadogan, into demonstrating the great sound and versatility of his Regent 25 combo amp for your delectation. Barrie lets rip on some classic guitars, his personal custom made guitar and a bargain basement axe, exploring the Regent 25’s sonic options. Check out Barrie’s interview with Guitarist Magazine here. Click here for Colin Smith’s video review of the KC30 head. Here are some samples of the Sir Charles 15 head using a Tayden True Brit speaker in an open-backed cabinet. Audio samples of the King Charles will follow soon. Audio recordings done by Joe using an off-axis SM57 and AT4040 for a little ambience, recorded via an RME Fireface. Guitar played by Dave Page. 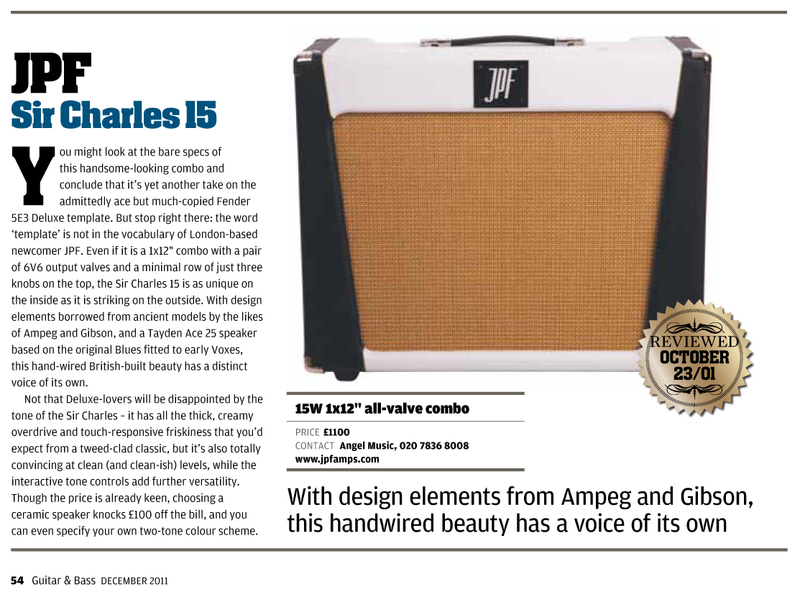 Click here for the review of our Sir Charles 15 combo in Guitar & Bass magazine. Click here for the Sir Charles “Gear of The Year” write up from Guitarist Magazine in 2011. Click here for a review of the Tayden 12″ guitar speaker range in Play Music Pickup magazine .